Nobody was injured in the incident which happened on Valentine’s Day. 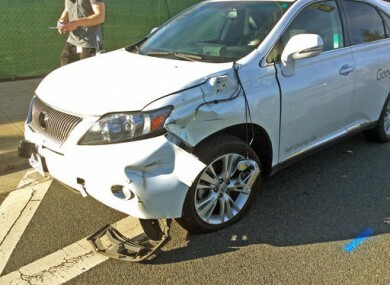 GOOGLE’S SELF-DRIVING car project took a bit of a hit, in more ways than one, when it ended up crashing into a bus last month. While both vehicles were travelling slowly and nobody was injured, it was the first case where Google’s car was at fault for a crash. So the Santa Clara Valley Transportation Authority through Associated Press has released footage of the crash as well as photos of the car and bus after the impact. The car was travelling at 3km/h while the speed of the bus was 24km/h. The car was following the “social norm” of pulling to the rightmost side of the lane to prepare for a turn. Despite that, the left side of the car came out with scrapes and dents while the bus ended up with a long scratch and one of Google’s radar units stuck on its side. The problem was sandbags were blocking its way in front of a storm drain so it needed to merge back into the centre of the lane. In doing so, it ended up hitting the bus. Google said the test driver in its car had allowed it to make the move despite seeing the bus coming as they expected the bus to slow or stop. “Our test driver, who had been watching the bus in the mirror, also expected the bus to slow or stop. And we can imagine the bus driver assumed we were going to stay put, said Google in a statement at the time. Unfortunately, all these assumptions led us to the same spot in the lane at the same space. This type of misunderstanding happens between human drivers on the road every day. Google later said it made “refinements” to its software so it will know that buses are less likely to yield to cars compared to other types of vehicles. Email “There's footage of the moment Google's self-driving car hit a bus ”. Feedback on “There's footage of the moment Google's self-driving car hit a bus ”.